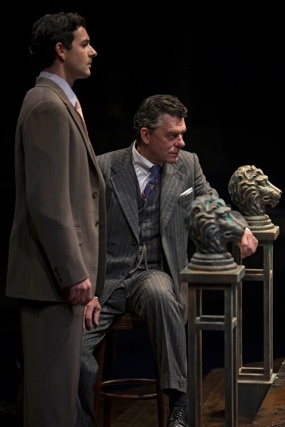 With its new production of The Merchant of Venice, the Stratford Festival does one of the worst things a theatre company can do to a play – make it boring. The reasons that bring about this tedium range from the simple – the inaudibility of certain actors – to the complex – the lack of a directorial vision. The Stratford Festival stages certain plays by Shakespeare so often that sometimes it seems as if nobody involved in staging the plays knows why. That’s is certainly the impression that Antoni Cimolino’s Merchant gives. Overall, it is superior to Richard Rose’s garish Merchant in 2007 and to Richard Monette’s farcical Merchant in 2001. It is, however, leagues behind Marti Maraden’s powerful Merchant in 1996 starring Douglas Rain, which remains the finest staging of this play I have seen at Stratford. This is even more apparent since Cimolino’s staging borrows Maraden’s idea for the setting but does not know how to make it work. Cimolino has relocated the start of Shakespeare’s play to the day of Italy’s invasion of Abyssinia in 1934. We know this because he begins the play with people running about the stage declaring the news. The fascist party had already been in power since 1922, but official discrimination against Jews did not begin until 1938 when the Manifesto della razza stripped Jews of their Italian citizenship. Marti Maraden set her production in this same period but showed with great subtlety how Christian Venetians were beginning to become uncomfortable around Jews, whom they had compelled to live in the world’s first ghetto since 1516. Maraden must have known that anti-Semitism was not part of fascist policies until 1938 and that even after the Manifesto della razza was promulgated it was not popular. Her production gave the sense that nasty change was in the air. Cimolino, in contrast, portrays Venice of 1934 as if it were the same as Nazi Germany which had promulgated official antisemitism since 1933. Cimolino therefore shows adult Venetians spitting on Shylock as he passes, children throwing rocks at him and the masquers removing and trampling on the mezuzah outside his house. One would think the point of choosing this setting were to enlist the audience’s sympathy for Shylock and its antipathy against the Christian Venetians. That is certainly how Maraden’s production worked. Cimolino, however, confounds this scheme by having Scott Wentworth portray Shylock in the most unsympathetic way possible. Cimolino gives Wentworth’s Shylock the off-putting habit of always wiping his mouth with a handkerchief as if her were constantly drooling. His tone of voice is always harsh and rasping and his body language suggests a suspicious gangster quite unlike the upright, dignified old man that Douglas Rain portrayed. Wentworth makes Shylock so mean-spirited that it is no surprise that Launcelot Gobbo and Jessica would want to flee from him. The result of making both Shylock and the Christian Venetians unsavoury is that we care about neither. The problem is exacerbated by Cimolino’s failure to establish that there is any friendship between Antonio (Tom McCamus) and Bassanio (Tyrell Crews). McCamus presents Antonio as so self-involved that he hardly ever looks in Antonio’s direction. It seems more as if Bassanio is begging money from a distant relative than from a man he loves and a friend and who loves him. McCamus’s Antonio is so aloof that we really don’t care if Shylock kills him by taking his pound of flesh or not. As Portia, Michelle Giroux retreats to her old habit in Shakespeare of speaking every line with exactly the same intonation and accentuation no matter what the mental or emotional state of her character. She gives us a sense of vague concern but nothing more. When Portia and Nerissa disguise themselves as lawyers, Cimolino has them do nothing in speech or gesture to suggest that they are men. Cimolino ruins Lorenzo’s long Act 5 speech about the importance of music with constant interruption. Instead of calling in musicians as in the original, Cimolino has him turn the radio. The music soon crackles and is interrupted by what seems to be Mussolini shouting a speech. Lorenzo says a few more lines, then tries the radio again turning the dial. this time the music is interrupted by Hitler shouting a speech, which leads Lorenzo to his lines, “The man that hath no music in himself, Nor is not moved with concord of sweet sounds, Is fit for treasons, stratagems and spoils”, thus narrowing Shakespeare’s general statement to a specific political comment. Tyrell Crews thus emerges as the only actor able and unscathed in the entire production. At least Douglas Paraschuk’s set is attractive though the red-and-white poles and the gondola are unnecessary. He places ornate grillwork around the Festival Theatre onstage balcony creating the image of a large beautiful cage. The doors to this cage are wide open in the Belmont scenes but the cage also serves as Shylock’s house where the doors are aways closed. Paraschuk thus suggests more subtly than Cimolino the question of Portia’s imprisonment by the terms of her father’s will and the question of whether Shylock is caged in by Venetian society or cages himself in to protect himself and Jessica from it. Charlotte Dean’s costumes are lovely, especially the sequence of gowns she creates for Portia that feature the longer calf lengths and higher waists of the early 1930s. Cimolino has asked composer Keith Thomas to write a cinematic orchestral score that tends to recall later Hollywood films like The Godfather. This does not quite suit the subject which is neither epic nor unqualifiedly romantic. Cimolino’s one good idea is to show that Portia is shocked after saving Antonio by the impositions, such as conversion to Christianity, that Antonio asks to be placed on Shylock. When Gratiano tears off and tramples Shylock’s yarmulke, Cimolino has Portia pick it up when no one is looking. Near the end of the play she gives the yarmulke to Jessica, who not only has converted to Christianity but shorn and bleached her long dark hair to look like a 1930s chorus girl. The light fades as Jessica (Sara Farb, unfortunately without expression) gazes at this sign of her father’s religion. Brian Bedford was originally scheduled to play Shylock but had to pull out due to health reasons. Judging from his past performances where he has made even the most villainous characters charming (viz. his Richard III in 1977), it is difficult to believe he would have portrayed such a thoroughly disagreeable Shylock as Wentworth does. Cimolino’s approach makes an already problematic play even more problematic since it cuts out the heart of the play and leaves it as a corpse that the rest of the cast fail to animate. While Cimolino’s Merchant is not so full of follies and bizarreries as Stratford’s last two Merchants, we will have to hope that the next director and cast can at least approach Maraden’s insightful Merchant when the play next comes around. Photo: (top) Scott Wentworth as Shylock; (middle) Tyrell Crews as Bassanio and Tom McCamus as Antonio . ©2013 David Hou.